Virginia Soccer Association’s offers various recreation programs for children ages 2-19 in Haymarket, Bristow and Gainesville Virginia. VSA has established programs that allow your children to learn the game of soccer in a fun social environment. Little Gunners is a 6-week program that meets once a week. Little Gunners emphasizes fun while learning the game of soccer from one VSA’s experienced staff coaches for all players born in 2015 & 2016. Season begin April 1st & 2nd, 2019. VSA’s U5 program is based on the learning the beautiful game of soccer while in a fun and social environment for all players born in 2014. The program is 9 weeks long consisting of practice once a week at your preferred location and 8 Saturday game days at James Long Park in Haymarket, Va. Season begin April 1st & 2nd, 2019. 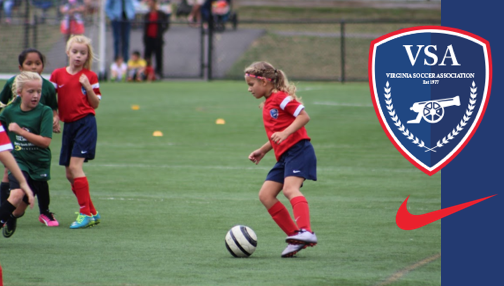 VSA’s U6-U12 program is our most popular at VSA. Players get to participate in a social environment with their piers while learning the technical and tactical phases of the game. This is for all players born 2007- 2013, and will be broken into respective age groups. The program is 9 weeks long consisting of practice twice a week at your preferred location and 8 Saturday game days at Long Park. Season begins April 1st & 2nd, 2019. VSA’s SFL program is a chance for players to play against other teams from the Northern Virginia Area. It consists of 8 games, 4 played at home locations in Haymarket, Virginia and 4 played at away locations in Prince William, Loudoun or Fairfax counties. The season concludes with a tournament the final week of the season. This program is for all players born 2000-2006 and then broken into teams based on the respective age groups. Season begins April 1st & 2nd, 2019.